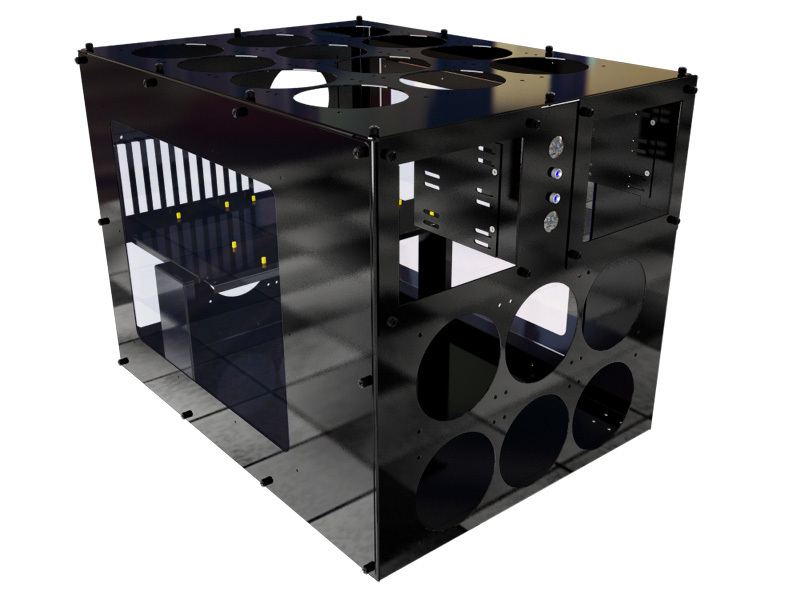 EXTEND to new depths with a Mountain Mods Extended U2-UFO aluminum computer case! The Mountain Mods Extended U2-UFO adds 6 inches of depth to the already massive U2-UFO platform. The behemoth stands 18 inches tall and wide while extending 24 inches deep. The increased depth of the case increases valuable floor space. Want to run 2 Skulltrail or any other EATX builds in the same case with LOTS hard drives and have it all water cooled? The extra depth simplifies the task by providing ample space to utilize Mountain Mods 120mm HD brackets attached to radiators. The Choose Your Own series allows you to choose from a variety of possible configurations. The Extended U2-UFO like the U2-UFO is COMPLETELY MODULAR - or "HYPER MODULAR" as we call it. The front and back panels can rotate 90,180,270 degrees for a different configuration. Or easily change your configuration by purchasing individual panels. The Extended U2-UFO is fabricated by skilled workers in the USA. It is made from thick aluminum making it lightweight, sturdy, and thermally friendly. Casters are included for easy mobility. Discover more space - EXTEND!